Google have 'identified over 100,000 businesses in the U.S. as "Favorite Places on Google" based on Google users' interaction with local business listings.' Each business will be sent a window sticker with a unique QR code that will link to reviews, stars, personal favourites and more. A gallery of Google favorite places can be seen here. 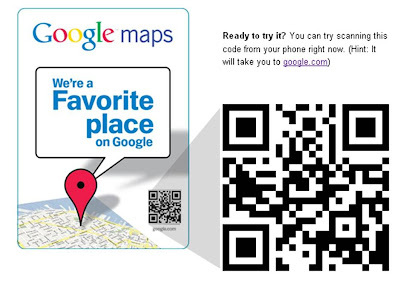 Whilst this is only for US businesses, it is yet another sign of both Google moving into the mobile space and QR codes further entering the mainstream.